All year round Trips is 6 days, 5 nights. Sunday through Friday. Includes 3 meals per day – all home cooked and from scratch! 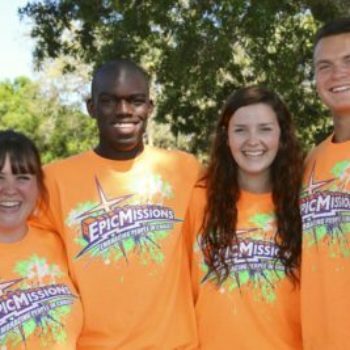 Family Missions Trips to Florida are perfect when you rely upon Epic Missions to plan your itinerary! Let us do the work for you. The full team package is $369 per person 10 years of age and up. $199 per person ages 5 to 9 and children under 5 are free. A $79 deposit due to hold your dates and the balance is due 60 days prior to trip date. Food Bank, Soup Kitchen, Homeless Ministry, Tutoring to At Risk Kids, animal shelter care, care for special equestrian horses, work with Vacation Bible School, working with migrant farmers, Neighborhood block parties, working with “at risk” teenagers, Pre school care ministry, working with special needs students, basketball, soccer or volleyball with kids – You choose based upon your teams’ talents and desires – we make it happen. Your meals, housing, Epic Missions Guide, and itinerary for your missions trip are included. You are responsible for all travel to and from Epic Missions as well as your travel while serving through Epic Missions. Extra expense and spending money is required if your team chooses a day trip to an area attraction. We are 7 minutes from one of the finest beaches in the world and 90 minutes from all of the Orlando attractions.